I am a licensed Marriage and Family Therapist (MFT) and have been working in the field of therapy since 2001 and have been a life coach since 1999. I received my Bachelor of Science in Psychology and Counseling from the University of Roehampton in London, and my Master’s degree in Counseling Psychology (with a focus in Expressive Arts Therapy) from California Institute of Integral Studies (CIIS) in San Francisco. In 2010, I completed the Child Trauma Training Institute’s Child-Parent Psychotherapy Training Program (in collaboration with UCSF’s Child Trauma Research Program). 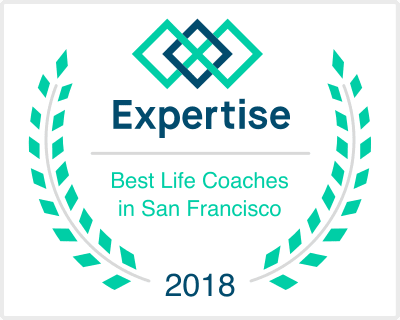 Alongside my work as a therapist, I provide Clinical Supervision and ongoing training for therapists in training at a mental health clinic in San Francisco. I trained in EMDR (with EMDR’s founder Francine Shapiro’s Trauma Recovery/Humanitarian Assistance Program, as well as author and trainer, Philip Manfield, PhD) and find it a powerful and effective tool for working with a huge variety of issues, from childhood or recent trauma to procrastination. My passion for supporting couples led me to advanced studies (with Dr. Sue Johnson as well as Dr. Rebecca Jorgensen) in the highly researched and effective Emotionally Focused Therapy approach. I am currently enjoying my ongoing training in Somatic Attachment Therapy, an approach rooted in neuroscience and the body. As part of my commitment to service, I volunteer and see clients on a pro bono basis at a local holistic, community mental health centre.